I’ve been working a wee bit of satin stitch lately. It’s nothing fancy. It’s nothing huge. It’s just a little embroidery project, worked primarily in satin stitch. The little speckles in the scalloped area of the design are where I’ve started and ended my threads. They’ll all be covered up eventually. Underneath the satin stitching, there’s a bit of split stitch and straight-stitch padding going on. The whole little elements fits within approximately a 3″ x 3″ square. I’m working on linen using cotton floche. Floche makes a great satin stitch! Yep. Satin stitch makes me happy! I’ll probably finish this little piece today at some point, and then I’ll show it to you in full. Are you working on something that makes you particularly happy? I hope so! I’m just starting “Nature’s Vision” by Sally Smith (http://www.artsanddesigns.com/cgi-bin/viewDetails.pl?catnumber=210854244) for my youngest son. He wants to be an Eagle Scout like his older brother and his cousin, and this is the Eagle project he chose for me. It’s really beautiful and challenging, and I’m looking forward to the project. I can see the markings for your design. Did you use the pounce method with the Martha Stewart pen? I have been reluctant to use it because it says that it is permanent. I’m sure that something else will hide the markings, however, mine always seem to peep through somewhere no matter what I do. Could you pounce, paint, then wash the whole think to get the paint out? I always work on something that makes me happy, if it does not, it is more like work, and no reason to have it as a hobby. Oh, Yes! Reading your column makes me happy! And of course, ANY time I have a needle in my hand! Dear Mary, I am busy with my Peacock. It is really challenging, but it gives me tremendous satisfaction with each little stitch I make. I am finished with the difficult parts and it is coming together nicely. See the photo I have posted on your Facebook wall. 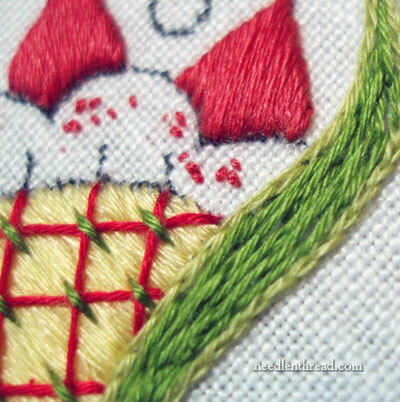 I love the peek at the satin stitch you’ve given us! The lattice over the satin looks wonderful. I haven’t found floche in a local shop, but at some point I’m going to have to order some, because every time you use it, it looks so lovely. I have been playing around with Mountmellick work – both traditional and some experiements. I have a project that is my own design in traditional thread on a hand-dyed linen that I like and I just ordered a lighter sateen from Celtic Linens to see how traditional thread will work on a lighter weight traditional fabric. I took pictures of the onion flowers in my garden and hope to make a Mountmellick design featuring them – after all the traditional Irish embroiderers took their design elements from what was growing in the area – I think I should too – but it is all making me happy, as is your wonderful site. Thanks again. Hello Mary, how many ply of floche do you have in your needle for doing the satin stitch? I’m sure in has a gorgeous lustre to it unlike floss. ALos your comment about satin stitch makes me happy; I just ordered new canvas edge tape for my shop and included in print Stitching makes me Happy Happier Happiest. As always you are a fantastic happy stitcher. At this moment I am working on a cross-stitch sampler. For weeks everything I put my hand to was “bleah”. I was anxious to start stitching on something, so I grabbed some 32-ct linen and a sampler book and started stitching. (my first cross-stitch) As each letter developed I started feeling happier and happier. 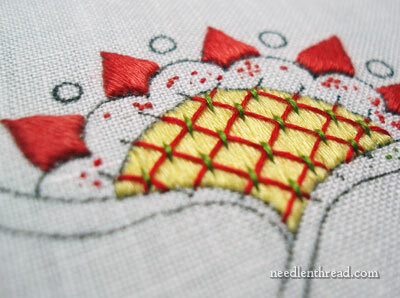 To have something to stitch and be pleased with the outcome – that makes me happy. As always, your satin stitch and all you other stitching is meticulous and beautiful! It inspires me to do more. I have wondered about this for quite some time and seeing these photos reminded me – it’s about all the little (in this case red) stitch marks showing in the adjacent area. I know they will be covered up and I’m guessing they have to do with starting or finishing with a thread, but I don’t understand your technique really. Are you doing something different than waste knots away from the work to start? Are you somehow ending your thread there instead of digging into the back of completed work? Is there a trick or great technique here that I’m missing out on? Thanks for all your wonderful and helpful information! Satin Stitch makes me happy, too! But then all embroidery does. Yellow and red are not my favorite color combinations, but it will look nice, I’m sure. I am looking forward to seeing the finished product, tomorrow, perhaps? At present I am reknitting a sweater for my beloved. As I am a perfectionist and hate waste, I guess I am happy, right now I just want the damn thing done! I would much prefer to be doing some embroidery: I love monograms. Which reminds me, I was under the impression that you were going to have a special class doing monogramming this past winter/spring – What happened? Are you still going to have it and would you please, please, please keep my name in mind should you ever have it? That’s *my* favourite stitch! =)It’s a pleasure to do it. Great result. Hi Mary, the little snippet above looks lovely. The Hardanger supper cloth I was working on for an elderly, sight-impaired lady has been reclaimed, so when i was looking around for other stitching to do I had some many ideas I felt slightly over-whelmed, so I decided to work on some UFO’s and the pile is getting smaller, so I am happy.